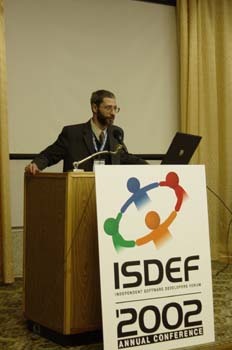 The 2002 Independent Software Developers Forum's (ISDEF) annual conference was held in the Research Center of the Russian Academy of Sciences Chernogolovka (40 km from Moscow), on the September 28-30, 2002. 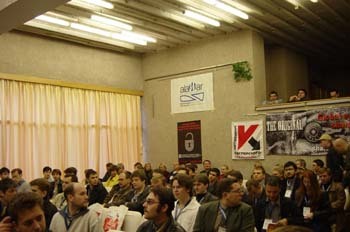 More than 300 independent software developers and well established companies from Russia and abroad specializing in making of original software applications and selling them via the Internet have participated in the conference, including more than 30 guests from the USA, Canada, UK, Germany, France and New Zealand. A number of well known companies and government organizations from Russia and abroad are among the participants and the speakers: Microsoft, Intel, Borland, Abbyy, Kaspersky Lab, Mediahouse, Paragon, Lan Crypto, TuCows, Digital River, Lockergnome, WSKA, Thompson Partnership, share-it!/element 5, representatives from the Ministry of Justice of the Russian Federation and law enforcement agencies participated in the ISDEF'2002 annual conference. The conference have been covered by many journalists and reporters who have attended the conference. Among them are Commersant, Izvestia, Computerra, InfoBusiness, PC Week RE, Computer World, PC World RE.